MANILA (UPDATED/CORRECTED) - President Rodrigo Duterte on Thursday cleared a Davao-based businessman being accused of involvement in the illegal drug trade. 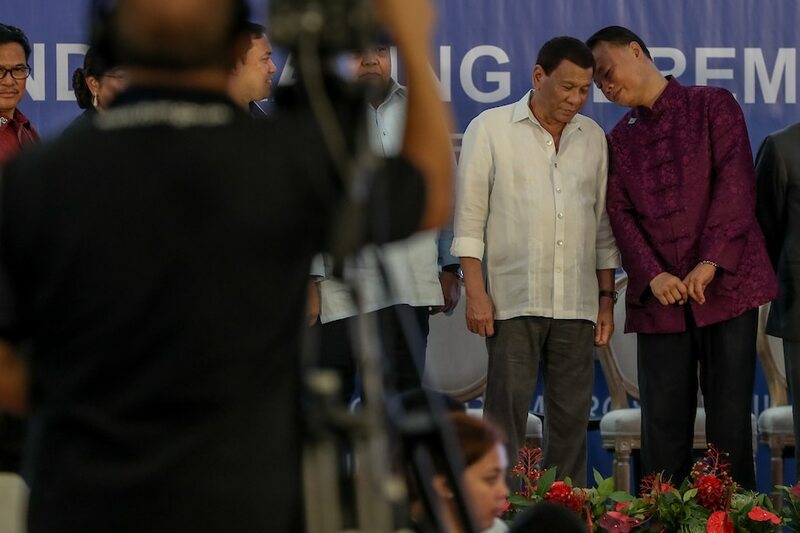 Duterte said Michael Yang, who is the owner of the Davao City Los Amigos (DCLA) stores in Mindanao, cannot be involved in the illegal drug trade, citing the latter’s ties with Chinese Ambassador to the Philippines Zhao Jianhua. The President said aside from having close ties with Zhao, Yang supposedly was once part of the entourage of Chinese Premier Li Keqiang. “Ito daw si isang Michael Yang na drug addict daw. Michael Yang, ang ambassador ng China, diyan natutulog sa bahay niya. At saka kasama ‘yan doon sa entourage ni Premier of China,” Duterte said in a speech before Philippine Military Academy alumni in Malacañang. Duterte said Yang also supposedly dropped by one of his command conferences and offered to bring in more investors to the country. “Sabi ko, oo. Tapos dala-dala niya ‘yung dalawang bayong na cellphone para consignment lang. Talagang naghirap ‘yan,” he said. In his speech, the President identified a certain “Acierto” as having linked Yang to the illegal drug trade. He, however, did not provide further details. Presidential Spokesperson Harry Roque also came to Duterte’s defense and gave a clarification to what the President said. “Hindi po pwedeng maging drug lord si Michael Yang dahil natutulog sa bahay niya ang Ambassador ng China. Iyan po ay respetado sa People’s Republic of China,” Roque told dzMM. Editor’s Note: An earlier version of this story said that President Rodrigo Duterte linked a suspected drug pusher and user to Chinese Ambassador Zhao Jianhua. This story has been revised to reflect the clarification made by Presidential Spokesperson Harry Roque.